Louisiana had the highest adult-obesity rate in the country in 2012 at 34.7 percent, according to a study called “F is for Fat” by the Robert Wood Johnson Foundation and the Trust for America’s Health. Natalia Hauck, a clinical dietitian at the University of Iowa Hospitals and Clinics, believes her patients could benefit from easier-to-read nutrition labels on packaging and containers. That may happen soon. The U.S. Food and Drug Administration is proposing changes on nutrition labels on food and beverage packaging to bring the information up to date with the latest research and to help people understand what they are eating and drinking. It will take public comment until June 2. 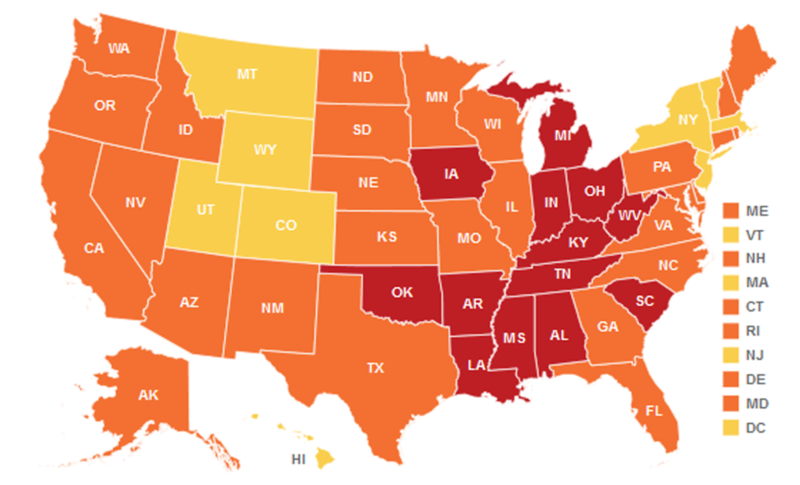 The updated information could especially be useful to Iowans and the rest of the Midwest, where obesity rates are among the worst in the country. Iowa is the most obese state among its seven neighbors, ranking third in the 12-state Midwest and 12th in the nation, according to the July 2013 study called “F is for Fat” by the Robert Wood Johnson Foundation and the Trust for America’s Health. The study found that Iowa's adult obesity rate is 30.4 percent, up from 23.9 percent in 2003 and from 12.2 percent in 1990. Iowa’s closest neighbors in Missouri, Kansas and Wisconsin barely do much better. In the rest of the Midwest only Indiana and Michigan rank worse, coming in eighth and 10th, respectively, nationwide. In a 2013 survey for the Gallup-Healthways Well-Being Index Iowans said they do well in overall mental, emotional and physical health, but ranked 33rd out of the 50 states in the healthy behavior category. Figures like those prompted the Healthiest State Initiative, a privately-funded effort funded by Wellmark and backed by Iowa Gov. Terry Branstad with a goal of making Iowa the nation’s healthiest state by 2016. [caption id="attachment_2166" align="left" width="581" caption="Louisiana had the highest adult-obesity rate in the country in 2012 at 34.7 percent, according to a study called “F is for Fat” by the Robert Wood Johnson Foundation and the Trust for America’s Health.